So, a friend (Frogman) had this beer and told me he couldn't even taste the coffee in it, and he liked the beer. Well, I'm going to rely on his take and try the sucker out for myself. Mind you, I'm the guy who complained that a Keurig once had coffee go through it, and I could taste it in my hot chocolate (and no one around me - including Frogman - backed my play). 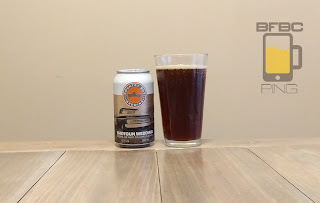 The beer so brown that it is black has a light tan head with bubbles that are too large to be nitrogen, but they are not really as big as most carbonated beers. The head is thick, but it doesn't have any stickiness. When it leaves, it leaves only footprints and memories with an aroma is coffee and earth. So, let's see where we go from here. First sip is what they say on the can - coffee. What did I expect, really? I suppose mocha might mean that it also has chocolate or something, but I am getting nothing but coffee. I need to read labels before I buy beer from now on. I noticed that I stopped commenting on new breweries. 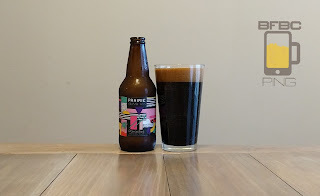 I seem to be going through them so quickly these days that it barely even registers that I'm getting to try a beer from a whole different place, brewed by entirely different people, and using entirely different methods. I mean, who'd have thought people from.... Boston would drink? The delightfully amber beer has a sticky head that makes me happy. The aroma is weak as all-get-out. I mean, there appears to be almost no smell. Do I have a cold or something? If so, I have no other symptoms, and I can still smell my (currently wet) dog, the bag of Jalapeno cashews I have, and the beef jerky in a bag on my desk. First sip is all malt up front and all bitter and pointy bits at the back. The back is so harsh that it ruins whatever the beer is trying to do. I can't say this is a good beer to sip, but it might be a good beer to drink like you mean it. What the hell? 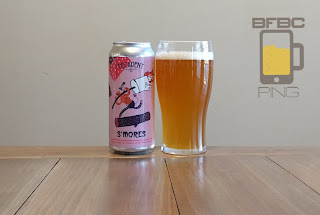 I hadn't ever seen a s'more-based beer until a few weeks ago, and now I'm looking at my third. It was like when I had those peanut butter and jelly beers or when Armageddon and Deep Impact came out. It might even be like when White House Down and Olympus Has Fallen came out. Someone heard about something in the works and said, "I can do that!" Well, let's see if they can. 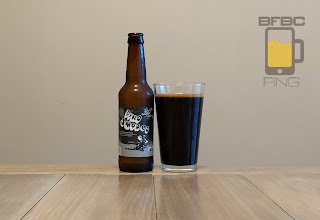 She's a pitch black beer that loses the head pretty quickly, and it loses it completely. I mean, there is nary a bubble atop this sucker - like a cider, really. The aroma is chocolate, coffee, maple, and some soft wood. Its smell is probably the best of the s'mores beers so far; I wonder if the taste will follow. I can't go on about Bearded Iris anymore. Much like my love of Lagunitas (haven't had a new one of those in quite some time) I think I need to stop my effusive gushing of love for them in these reviews and just get on to business. They aren't always the best beers, but they are very interesting, and that'll get you somewhere. 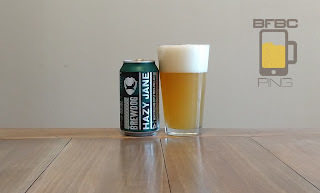 The delightfully very hazy and brassy-gold beer has a very nice head that boils down to a patchy mass with gobs of lacing left on the sides as if the head didn't like to be taken away and left its claw marks. The aroma is a strong citrus (orange and grapefruit) with bitterness right on the nose, but a flaky malt is somewhere under that. I'm not sure I could pick three better craft breweries to combine efforts to make a beer. However, I don't know what to make of the resulting ale. It says that it's "brewed with parsley, sage, rosemary & tyme." It was they who used all of these spices and no Oxford comma. Attention to detail, then, might not be at the fore. The very light gold (verging on yellow) beer has big bubbles (with some teeny tiny ones hovering around it) that leave more than enough lacing for this... ale? I mean, it's not a pale ale, IPA, APA, DIPA, or anything like that. It just says it's an ale. The aroma is all kinds of spices and flowers, and that isn't surprising considering what they printed on the label. Well, as I write this, summer is about on us, so I'm grabbing a beer and enjoying the company of my puppies. Today, I have a beer from Asheville, NC. As I have found, beers brewed in the South can totally go toe-to-toe with the big names from the North and the even bigger ones out West. Let's see if this holds up. That is one hell of a bright yellow beer. It carries a very thick, big-bubbled head that is fluffy and sticky. 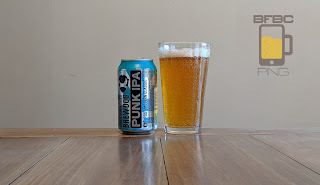 It leaves a nice patchwork of lacing down the sides of the glass and emits an aroma of light, fanciful hops of the citrus variety, but they aren't heavy like an IPA. First sip is very, very nice. It's crisp and smooth at the same time - a rare occurance as far as I can tell. It has very nice, light hops forward with citrus, peach, and (as the bottle proclaims and may have influenced me on) apricot. There's a nice biscuit and cracker malt that has a backing with some grains. I could sip this all day, but I'm not going to. 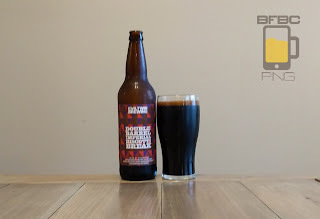 The absolute best that Prairie Artisan can probably hope for in this review is somewhere in the 2.0 to 3.0 range. Fact is, they've only had one beer that was above a 2.0, and that got a 2.25. The way my rating system works, anything between a 2.0 and a 3.0 should be about average. For the specific brewer, it seems like an average beer is the best they can do. 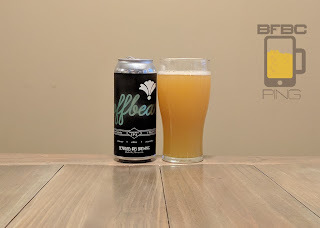 This is especially disappointing as they are a craft brewer who appears to want to break out of the mold, but they simply seem to lack the ability. Maybe that'll change with this beer. The black beer has a thick dark tan head that winds up as one big, thin lily pad on top of the beer. The aroma is thick, and it's filled with chocolate, coffee, coconut, vanilla, and sweetness. There's not a whole lot of smoke in the smell, and that seems unusual for an Imperial Stout. But, these guys like to do their own thing, and that's why we have different brewers that brew the same style. Variety is in the nuance. I hop they thought this one through. I hope it's not the hopposite of the fine tradition of IPAs. I hopped the top off the can, and the hops didn't exactly slap me in the face. I won't hop drinking until I get the ultimate score done with. Okay. I'm done with that stupid game. The amber liquid hosts a solid, thick cap of bubbles that never, ever goes away. The aroma is delicious, delicious hops of the citrus variety. To say that I am looking forward to this is to underestimate just how much I'm looking forward to this beer. First sip is surprisingly mild overall, but it has a harsh bite on the end that is very much off-putting. The bite is bitterness and nuts, and it doesn't seem like they really want to get along with each other. That cloud spoils what is a heavier malt and not nearly enough of the hops from the aroma. I need to dig in more. Is this named after The Great One, Wayne Gretzsky? As far as I can tell, it is not. This is brewed in California, and there is no mention of hockey on the label. 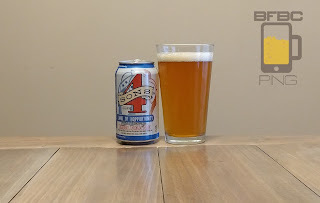 In fact, the label is completely dominated by the 4 Sons logo, and it's not a great one. It is, however, one that will likely appeal to the youth market (hipsters). Amber, a little hazy, and topped with a patchy, but not a sticky head. This beer will not leave lacing, and that in itself is noteworthy for an IPA. I like a stickier head than this. The aroma is a seared malt and citrus hops, so it is actually starting off well as far as the smell goes. First sip is sweet, mandarin oranges, grapefruit, a stiff cracker malt, and a little bitterness. I'm also kind of happy to see that I was wrong about the lacing - it's runny, but pretty good. So too is the sip. The mix of flavors are strong and more bold than crisp, but it's a strong stand for just a sip. Another 450 North, and I'm ready to play. I mean, this is a pilsner that they appear to have gone nuts on with the hop hammer, and that means fun times for Tim. 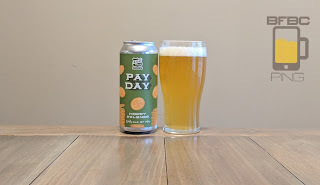 The name is a little difficult to see the connection with (Pay Day? ), but they can name their beer whatever they want. The design of the label, however, is pretty much junk. At least I can reliably read the name, right? 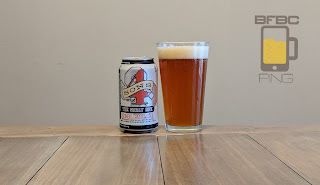 The slightly hazy, bright gold beer has a patchy top that leaves lacing for the eye and allows the aroma of citrus hops and bready malt to hit the nose with just as much pleasure. Its presentation is particularly good for a pilsner - and that must be the hops! I mean, it's "hoppy" right? First sip is delightfully citrus, bread, tartness, and lingering bitterness. The sip is very good; the balance is nice - it's not even, but clearly they played with it to give it a sweeter entry and a more bitter exit. I could sip this all night, but I won't. There are two exclamation marks in the title of this beer. They are in the middle of the name. It's a mango-s'mores IPA. All of these things do not speak well of the people who cobbled this together. The actual label is unique and kind of intriguing, so they have that going for them. Let's see if they know how to brew beer. The fact that this beer comes out a somewhat cloudy yellow is almost anti-climactic. I mean, the exclamation marks signal that a polka dot or striped beer seems more appropriate, doesn't it? Well, I guess we are still a slave to fluid dynamics. The head is nicely traditional IPA - sticky and leaving lots of lacing while leaving a patchy cap on top. 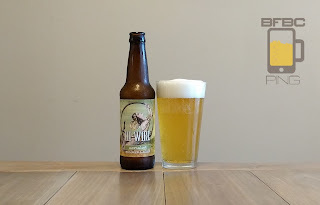 The aroma is a sweet marshmallow with some lingering floral hops, but it's understated. So far, the Country Boy beers are exceedingly average. I was hoping for another Yee-Haw where they were a little scattered, but relatively above average. Nope. So far, Kentucky can't match the Tennessee boys, and I hope it's eating at them enough for them to come up with some absolutely great brown ale. 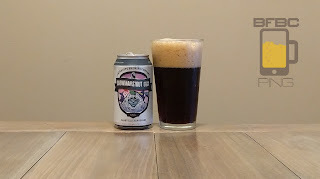 The undeniably brown ale has a fairly minimal head tat just goes away completely with only occasional bubbles coming to the top tell you that this is carbonated. That said, you won't mistake this for anything but a malty, nutty brown ale, as the aroma is pungent. I don't mean it's strong - it's invasive! The thing about these Stillwater beers is that they may classify themselves as "artisanal" but they have been particularly good. Even so, I've had this beer waiting in my fridge for me to swig for quite some time - I have been avoiding it. The only rational reason I can give for wanting to avoid it is the fact that artisanal beers are too often crap. Everything about the presentation puts me in mind of one of the bourbon barrel aged beers. It has that thick, syrupy texture. Even with a slow pour, the head on this thing just will not die down. Lacing is a frilly affair with tendrils remaining on the glass all the way to the top. The aroma is chocolate, vanilla, and a little coffee. What? What is this? What planet am I on? Is this going to be that odd kind of awesome that the Ben and Jerry's beer was? Because I'm totally down with that. These odd beers really make me fear for the future of beer brewing, though. I just hope that the ability to significantly alter the taste of the beer doesn't draw us away from the core - hops and malt. The head atop this swirling honey colored beer is decent at first, but it reduces to a simple film laying on top. The aroma comes through solidly, though, with an odd kind of strong wheat and grain above anything else. That said, the slightly toasted marshmallows do kind of squeeze their way through. The first sip reveals that this does not taste like a s'more. 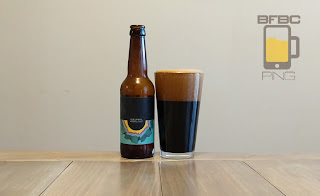 It's sweet like one, but it is also grainy, bitter, and that odd kind of hollow that I have tasted in some other beers, but I really don't think I've found the right way to explain it. You big, beautiful bastards! 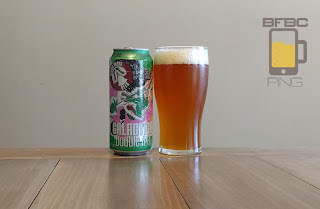 I knew you had another IPA in you, but I never expected another DIPA. 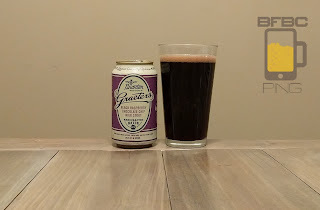 Bearded Iris isn't the greatest brewery out there, but they are easily in the top 5%. 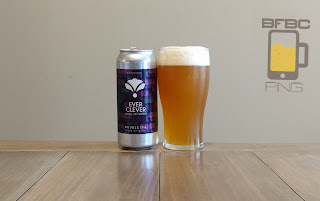 There are very few breweries that have me chomping at the bit to try out another beer that may be almost identical to the rest of their line, but Bearded Iris is in there. 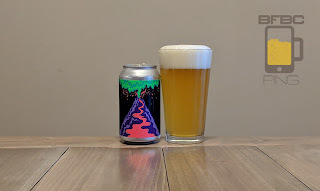 Another cloudy beauty from the guys that have a brewery just a stone's throw away. The head is really minimal from the get-go, and the remnants are just about nothing but a scattering of bubbles on the top. If there are any points of nucleation sizzling underneath, they are lost to the murkiness of the tangerine orange beer. First sip is bitter, citrus, floral, and a little funky. It's not bad, but it's not great. 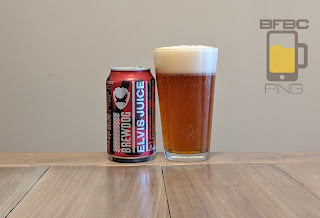 The funkiness is a bit unexpected, and the mix of it and the floral reminds me of some off-putting floral hop beers (and floral beers that actually used flowers) and that's not great. 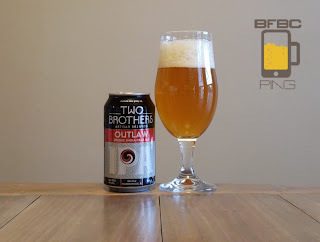 From the heart of Warrenville, Illinois <checks map> just close enough to Chicago for it to be an issue, but not close enough to get any of the windy city's benefit comes a beer that appears to be produced by two brothers. Do they consider themselves outlaws? Do they intend the beer for outlaws? Is the beer itself so offensive that it has been outlawed? Who knows. 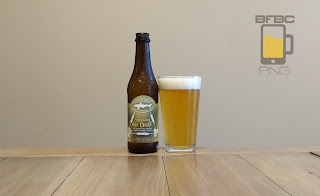 The clear, honey-gold beer has a very nice, dense head on top that doesn't leave any lacing, but it lets the pine and dusty hops aroma waft right up to my face-nose, and I'm digging it. I'm writing this toward the end of summer, and I just mowed the lawn, so I'm looking forward to a good beer (not that I'm ever looking forward to a bad beer).